Christmas is coming! Well not quite yet, but Christmas arrived a bit early for me this year with the delightful news that I’m to be featured in Tiny Owl Workshop’s ‘Krampus Crackers’ collection. Of course having grown up with my parents owning a small family greetings card business, Christmas used to turn up around March. Sadly it often arrived without the presents. So frankly September still seems a bit late to me! The timing aside however I was very happy to hear I was going to be featured in such an exciting little project. I really enjoy writing flash fiction, and the prompts that Tiny Owl Workshop give for their writing competitions are always enjoyable. The last involved a series of fantastic artistic inspirations which I blogged about here. This latest prompt will lead to a series of exciting literary crackers distributed around the bars and cafés of Leeds this Christmas. It’s always fun to see and be involved in the little twists of inspiration on how to engage an audience. The idea with this competition was to write a 100 word piece based around the myth of ‘Krampus’, a slightly disturbing creature of Alpine folklore who punishes naughty children at Christmas by carrying them away to his lair. Really what he should have done is just made them start talking about Christmas in March, that’s its own kind of torture. Instead, if the picture that frames this post is anything to go by, he just sort of licks their ears a bit. Gross, but hardly ground shattering evilness. So come Christmas myself and eleven other lucky authors will have the joy of (hopefully) inspiring a bit of literary Christmas cheer. Everyone likes a cracker after all. And if you don’t? 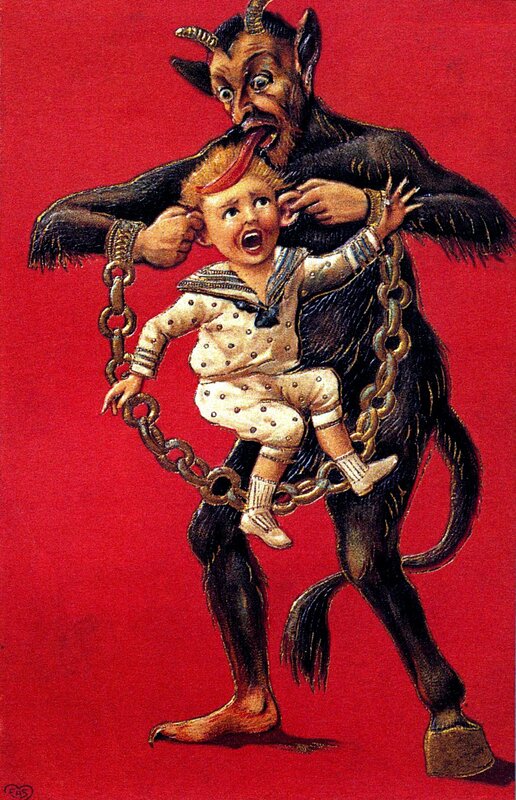 Best watch out for Krampus. I have to say though, that if someone who looked like that licked my ears, I’d be pretty freaked out!